We are excited to announce the next Quarterly Coalition Meeting! 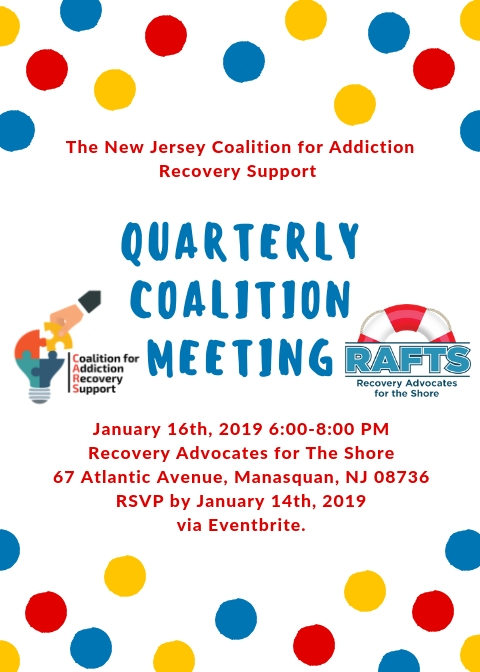 It will be hosted by RAFTS Recovery Advocates For The Shore, at their Recovery Center in Manasquan, NJ. January 16th, 2019 from 6:00 PM-8:00 PM. This is a free event open to anyone who might be interested in the Peer Support movement in New Jersey. RSVP by January 14th, via Eventbrite or on our Facebook page.